Grasshopper– A reference to earlier (much earlier) in his career when he appeared on a KBS show dressed in a grasshopper suit. I wonder if he imagined that one skit would follow him to this day. Yoomes Bond– Born in episode 38 when Jae Suk played the spy, a la James Bond. Yooruce Willis-First mentioned in episode 6 this nickname has stood the test of time (love it when fans yell it out to Jae Suk during filmingJ). Jae Suk’s Sunflower– A reference to Suk Jin and his twenty year friendship with Jae Suk, this nickname usually accompanies a disturbing pose from Suk Jin. Cute never looked so awkward. Big Nose Hyung– First uttered in episode 7, for good reason. Peaceful Gary- Born in episode 4 at the beginning of the human rocket game, the nickname often is used during the photo zone challenge (due to Gary’s consistently serene expression in the middle of chaos). Gaecholos Cage– Episode 10 started this nickname (as well as Harad Pitt). If Jae Suk can be RM Bruce Willis- Gary can be RM Nick Cage. Ace– The game of cops and robbers during episode 21 gave Ji Hyo her Ace title, fitting as she is one of the strongest cast members on RM. Mong Ji Hyo/ Blank Ji Hyo– A nickname that refers to the often expressionless stare that Ji Hyo is seen with (which is funny as she is truly one of the best players). 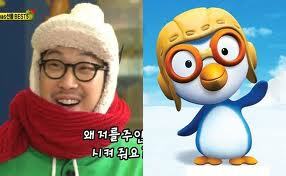 Song Ji Yok– First uttered by framer Kwang Soo in episode 11 this nickname refers to Ji Hyo’s “potty mouth”. Hararo– Created in episode 18 during the love boat game, this nickname makes reference to Ha-ha’s resemblance to the popular cartoon penguin, Pororo. Harad Pitt– Ha-Ha’s answer to Yooruce Willis, Harad Pitt is RM’s own Brad Pitt. Framer Kwang Soo– One of Kwang Soo’s first staple acts involved “framing” his fellow RM cast members. His framing technique involved outlandish rumors (usually about Ji Hyo or Jong Kook), delivered with a serious face. My favorite frame has to do with JKJ- did you know he plays with dolls? Giraffe– With a tall frame and awkward gait Kwang Soo brings to mind the African animal. This nickname has stuck with Kwang Soo for much of the show and has only grown in popularity (giraffe= betrayal is a common association made with RM). Kwangvatar– The first comparison between the lanky Kwang Soo and the blue creatures from the hit movie appeared in episode 36. Spartakooks– Born in episode 3, Yoo Jae Suk gave Jong Kook this nickname during the introduction for one of the games. The Commander– This nickname references KJKs dominating presence (and general like tendency to coach everyone around him). Mr. Capable / Capable One– For obvious reasons. My Hyung– The second half of the my hyung my dongsaeng relationship, KJK is called this by Ha-ha. Tiger– As the carnivore and fearsome predator, KJK has earned this nickname. It is often referenced with a sound clip of a tiger growling. You forgot Gary’s Sudden Commander! I can’t remember when they first references it (recent episodes), but it has to do with the fact that he occasionally turns out to be the strongest member. I still don’t understand why Ji Hyo’s nickname is Blank…Where did it come from? Did it originate from a Running Man episode or elsewhere? 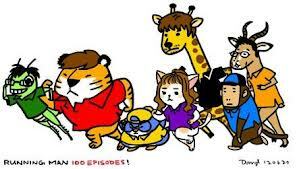 I started watching Running Man from the beginning (before I only watched the ones which had guests I liked in them) so I could know the origin. Kjk calls song ji hyo Mongji in episode 14..
yoo hyuk was first appear in the cruise episode..